Within this documented insanity “Letter to a Man” begins with Baryshnikov sitting in a chair dressed in a straightjacket, narrowly framed by black curtains as if he is sitting under an interrogation light. 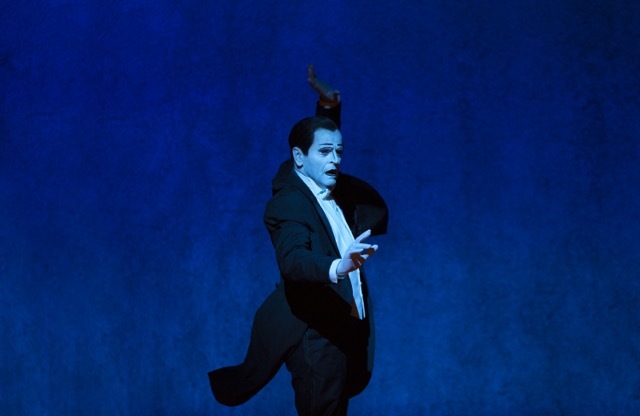 His face is made expressive by the whiteface makeup used in Nijinsky’s ballet role of Petrushka–part clown, part mime. He sits helplessly as he is accosted by the sounds of a loud ticking clock, the edgy hum of a drill or echoing uncontrollable laughter–all of which seem to be emanating from inside him. (Nick Sagar and Ella Wahlstrom, sound design.) No need layering the levels of lunacy here, LTAM starts full up at a crazy pace, shamelessly pulling out all the funny, not so funny, elements associated with madness with vaudevillian flair. Even the 1966 novelty record, “They’re Coming to Take Me Away, Ha-Haaa!” has its moment, in the burlesque comedy style of the opening scenes. These stylized bawdy acts alternate with more vague and poetic dreamscapes. In one such sequence fog rolls across the stage with Baryshnikov dressed in a top hat and overcoat waving branches in front of a bellowing scrim. Projected on the scrim are the blue silhouettes of naked trees. Within this misty milieu, Baryshnikov/Nijinsky follows an imaginary trail of blood in the snow. Hal Wilner’s bobbing string orchestration momentarily soothes like waves rolling over one another as Baryshnikov/Nijinsky repeats his action and words while lost in this dream. But, transitions are sharp in signature Wilson fashion, as jarring as a flashbulb or clapperboard snapping to denote a cut in a movie. These dramatic scene changes happen just as one is settling into them. One would imagine that the reason Wilson would collaborate with one of the great Russian ballet dancers to play the role of another great Russian ballet dancer would have something to do with dancing. Any one can play a lunatic. Yes, Baryshnikov speaks Russian throughout but any Russian-speaking performer with a musicality for movement could have played Nijinsky in this production. The choreography—listed in the program as “movement” is indeed just that–created by Baryshnikov and Lucinda Childs and is the least interesting component of this visually saturated production. That lack luster movement is also repetitive, variations on a limited theme. For dance sake, for theatrical sake, wouldn’t it have been entertaining to have even a snippet of Nijinsky’s style of dancing performed in “Letters to a Man.” Or did, in fact, Nijinsky stop all dancing even for himself the crazier he became? Even if not chronologically accurate, seeing Nijinsky dancing in a piece about himself could also be seen as a memory, a longing for his past, a longing for his sanity. What if that part was a cameo by a dancer other than Baryshnikov who hasn’t really danced in years? “Letters to a Man” is visually satisfying but fleeting. The most provocative elements of it comes from Nijinsky’s mad ramblings into his diaries, the words of those ramblings are projected in translations above the stage, uttered in Russian alternating in English by Baryshnikov from the stage, and by the cool-Laurie Anderson-sounding voice of Lucinda Child’s spoken text. “I am a beast, a predator. I will practice masturbation and spiritualism. I will eat everyone I can get hold of. I will stop at nothing” is staggeringly declared yet in that cool impersonal Wilson style void of melodrama. Wilson is a master of dropping, at times insinuating, the provocative as if to give greater credibility to over stylized imagery and nihilistic metaphors.